The blender-cycle at Habana Outpost, part of their Earth Day Expo. GLOBAL: Happy Earth Day, NYC! 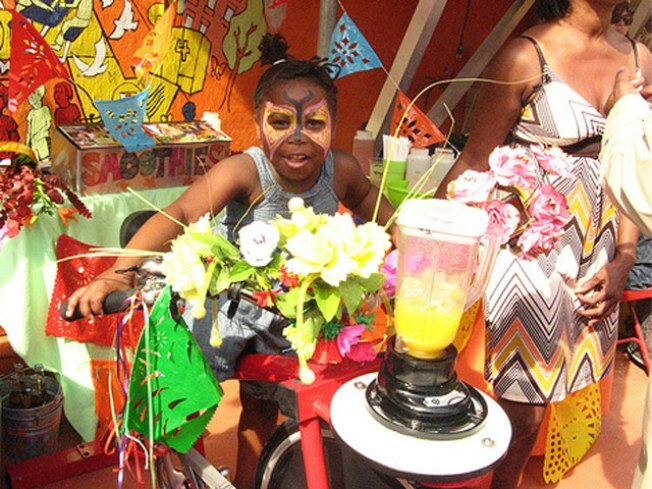 May we suggest swinging by Habana Outpost’s Earth Day Expo, hosted by the only restaurant we know of to employ a human cycle-powered smoothie (and mojito) blender (pictured)? More than that, they’ll have a fashion show of sustainably-produced styles, a composting and beekeeping demos, a green product marketplace and much more. Saturday, 12-6PM. HOWDYA LIKE THEM..: Apple pie may be as American as itself, but tarte Tatin is unequivocally French, and never this particular twain shall meet. Broadway Panhandler’s Gianni Savoca takes you through a (free) workshop to learn how to make this caramel-tinged upside-down delicacy on Saturday at 3PM. TRAPEZE: If you ever want to feel really out of shape, check out a performance by the Chinese Acrobats of Hebei, a troupe of gymnasts, contortionists and jugglers who create mesmerizing mid-air art out of gravity-defying feats. Sunday, Brooklyn Center for the Performing Arts, 3PM. ROCK EWE: And don’t forget: The Lamb Takedown gets underway at Bell House on Sunday at 4PM, as chefs and would-be chefs turn 15-20 lbs. of baa into a bid for victory. We got a tipoff that there’d be lamb cupcakes, to which we say: Go ahead. Convince us. Sunday, 4PM.